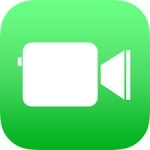 FaceTime is the simplest way for iOS users to communicate with their contacts by audio and video. It is especially useful for anyone who requires visual assistance at any time but it is also a really easy alternative to use for keeping in contact with friends and relatives. The chance to take photos with the video screen enables people to save special moments on their camera. Both the app and the operating system itself make this an essential app for anyone with an iOS device. It enables audio or video calls to be made from your iPhone, iPad and iPad Touch to other iOS devices, or even to a Mac. It has various features like calls to contacts using a telephone number or Apple ID, making audio or video calls, using the front camera to show your face, switching to the rear camera to show what you can see and taking a live photo with just one touch and creates “Favourites” to gain access to key people in the “Telephone” app. This Google tool is a simple way to communicate with people who have a Google account. It is accessible and easy to use, especially when an invitation to take part in a conversation is received. Although some may find it difficult to understand, it is comfortable and straightforward once it is understood its simplest uses. 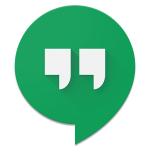 Google Hangouts is an app used for communication through messages between contacts, whether they be friends, relatives etc., videocalls, voice calls, and even sending photos, stickers and emojis. This communication platform is really easy to use and enables people who use different operating systems to keep in contact. Its interface is very intuitive for the app’s basic use, although the advanced configurations can prove more difficult for some people. The opportunity to change the way in which contacts are viewed is very comfortable for different types of visual impairment, and the ability to make calls to landlines is also of interest. This app provides free messages together with free voice and video calls for anyone. 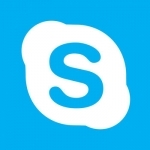 Skype offers features like: face-to-face videocalls, group videocalls for up to 25 people, free voice calls to anyone on Skype, instant messages to friends and adding up to 300 people to a group chat, calling mobile phone and landlines at low rates (Skype-to-Skype calls are always free) and sharing photos, videomessages, location and adding emojis to a chat.